Recently, I had the pleasure of attending a personal demonstration of ServiceWhale, a new online marketplace for home-improvement services. The goal of ServiceWhale is to provide custom prices for big-ticket home improvement services such as heating and cooling installations and replacements, roof replacements, bathroom remodeling, and flooring. The traditional process of contracting home-improvement services is not easy for homeowners. The process can take up to 30 hours, and it requires knowledge that not every customer has. From the contractor’s perspective, the situation is not very good, either. It costs contractors about $300 and takes around three hours to deliver an onsite estimate. On average, a homeowner wants to get three or four quotes before making a final decision. Thus, contractors close about 20 to 30 percent of their onsite estimates. ServiceWhale walks customers through the buying process using simple questions. First, a customer selects a service, such as an HVAC replacement, and enters his or her ZIP code (currently, the service is live in Philadelphia and the New York metropolitan area). The app then asks when the customer intends to begin the project. Next, the customer specifies what needs to be replaced, the size and efficiency of the HVAC system, where the units are located, and so on. Throughout the process, hints are provided to help if the customer gets stuck on a particular question. The homeowner can also upload photos and other information if needed. After registering for the service, the homeowner sees a list of customized quotes from all the contractors offering the service in the area. Contractors can list multiple brands of equipment for the same project. Once the quotes are generated, the customer can view contractors’ profiles. The service shows reviews and ratings for contractors from several sources. Contractors can also share photos of their previous projects. When contractors initially create their service listings on ServiceWhale, they have two options. The first option is to deliver a firm, binding quote upfront. In these cases, a customer can order and book the service online right away without any negotiation. The second option allows contractors to review the details of the request before confirming a price. ServiceWhale sends the contractor a message and a request for a call or an on-site visit if the customer has special requirements or concerns. Homeowners can even name their price, especially for higher-priced services. Once the quote is confirmed, ServiceWhale guarantees the price, provided everything is exactly as the homeowner described it. ServiceWhale does not get involved in the project or the associated financial transactions in any way. The contractor pays ServiceWhale a percentage of the project cost once he or she has completed the job. ServiceWhale provides a built-in service agreement stating what is included and excluded at that price. Contractors can specify their own payment terms. ServiceWhale has also established a partnership that allows contractors to offer attractive financing rates for homeowners; this service is free for contractors. Homeowners and contractors can get help from an experienced customer service agent. According to the company, this is a very important feature of a service that is otherwise highly automated. The homeowner gets multiple quotes from contractors in a few minutes. It is easy to perform due diligence on contractors. The homeowner can order the service online at a fixed price. Contractors have an easy, cost- and time-efficient way to provide quotes. The quoting process is free of charge. ServiceWhale provides contractors with access to an experienced salesperson. Customers get access to easy capital, and the contractor does not have to pay the fee that is traditionally required in such arrangements. The contractor’s profile ranks organically in searches. ServiceWhale recently announced a new “white label” product called MyServiceWhale. 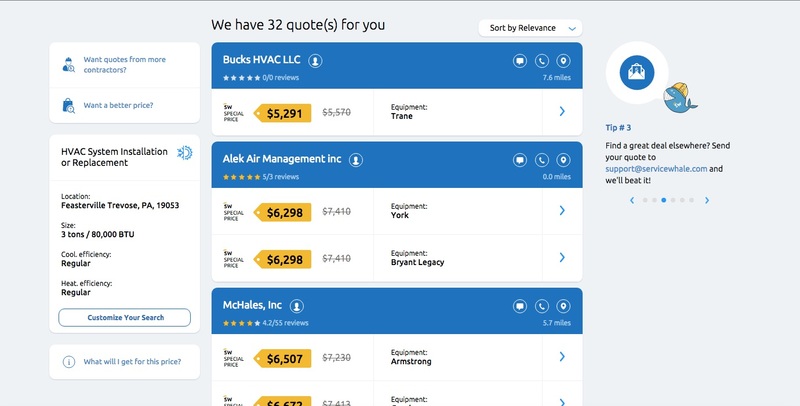 This subscription-based solution allows contractors to instantly generate quotes directly from their own websites using the same technology as that used in the marketplace. Based on what I have seen and heard, ServiceWhale is an innovation within this category of services. I have long been an advocate of service productization, and this is a perfect example of it.